Posted On July 24, 2014 by Team iCynosure. 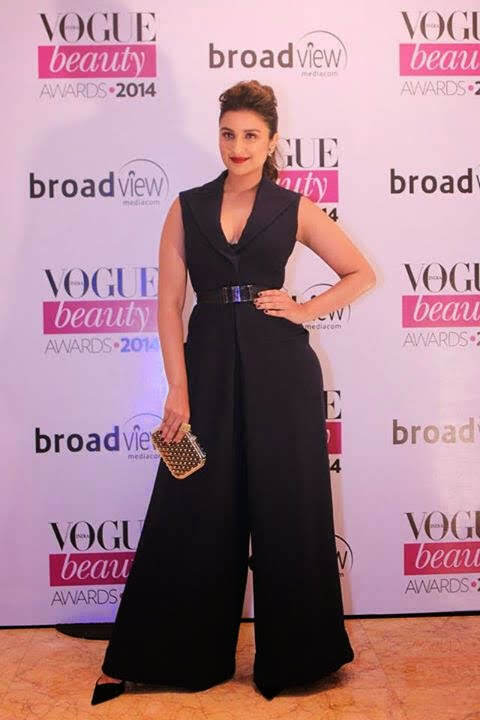 Parineeti attended the event wearing a wide-legged Dior jumpsuit. I loved her look except the overly bright lipstick and the pointed pumps. She won Flawless Face of the Year at the Awards, however, her overall look and posture reminds me of another beautiful belle from the industry. Maybe because she was styled by Anaita Shroff Adajania. Shilpa looked her awesome self in a Monisha Jaising Couture cutout gown as she styled it with diamond earrings and some gorgeous rings. Dramatic eyes and a flirty ponytail completed her look. With a body like that she can carry practically anything, however, I would have like a little more at the neckline. 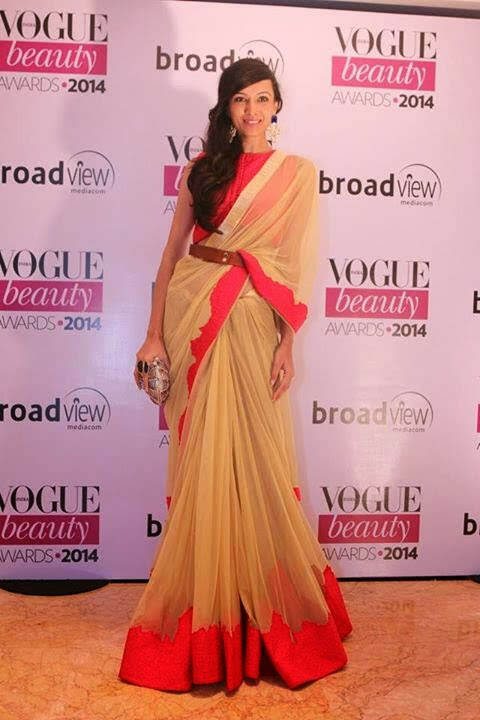 Quite unexpected Dipannita’s Archana Rao saree was a treat for sore eyes. The only thing I would have altered was the loosely thrown shoulder drape. Huma looked great in her Amit Aggarwal gown with her hair up and great lip shade. The strappy sandals added oomph to the look. A refreshing change from most of her not so noteworthy appearances, I like. Ileana looked mesmerizing in a strapless Kommal Sood chiffon lavender gown that highlighted her upper body with a bodice. I loved her soft makeup and side-swept hair, but the silhouette made her look large. 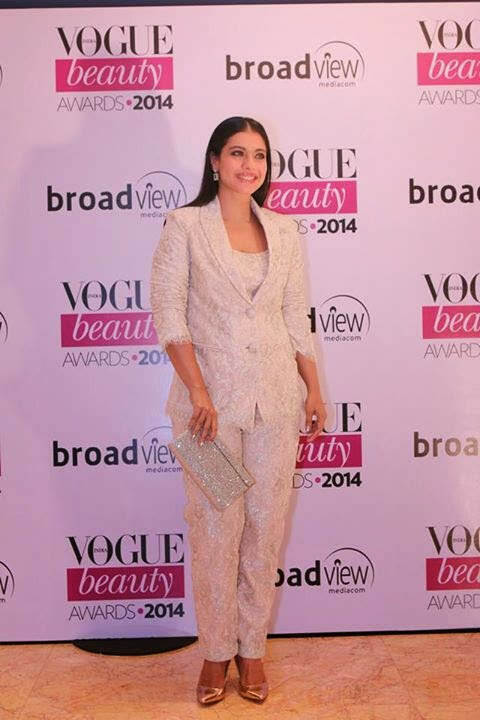 Kajol wore a Shehlaa by Shehla Khan lace pantsuit with rebounded straight hair a Jimmy Choo clutch and gold pumps. I thought…. well forget what my opinion is, what the hell was she thinking? Just as expected Kangana looked every inch the glamour fashionista she is now being recognized as in her Namrata Joshipura pencil skirt and bralet. Statement earrings and Tom Ford sandals completed her look. I loved the way she wore her hair… fun and flirty. Lisa attended to bag the Breakthrough of the Year award wearing Deme by Gabriella. She went in for her tried and tested look in a slinky cutout dress which for me did nothing for her. It is a look that she has sported umpteen times, and I’d like her to make different choices. Wearing Huemn separates; Neha experimented with a jacket that would otherwise be considered a No-No. However, pairing the outfit with a fabulous choker neckpiece did the wonders and she pulled off an amazingly sleek look with hair pulled back. A great look but I would trade the pumps with strappy sandals. 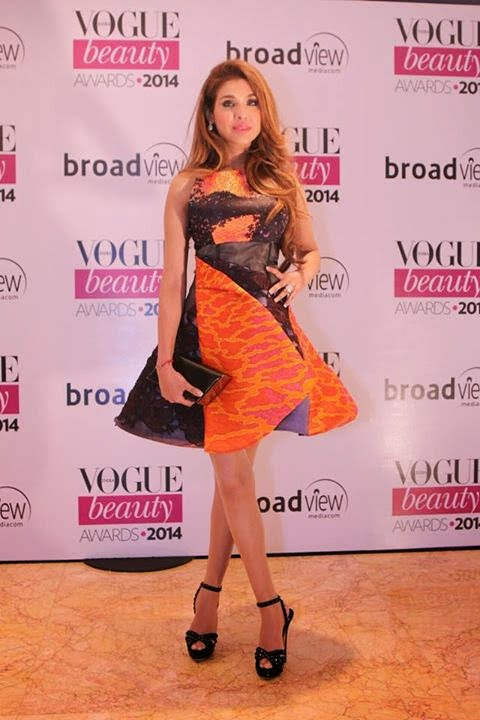 Socialite Niamat Bakshi picked a Peter Pilotto Origami Pleat A-Line Dress with a box clutch and ankle-strap heels. She looked great. 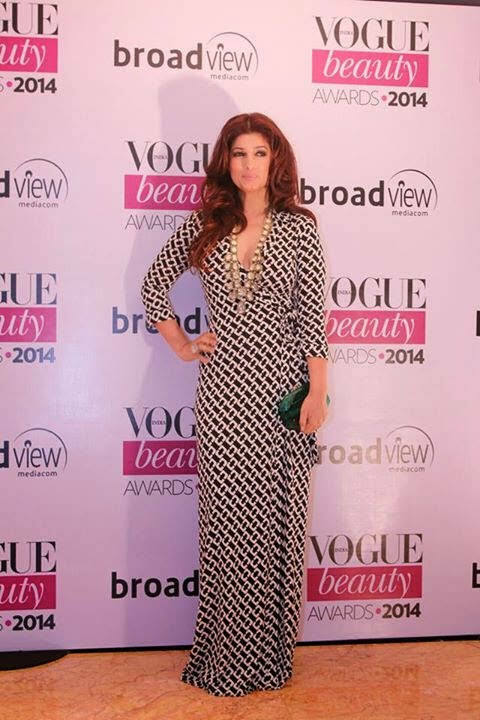 Newbie Nimrat went the retro way with her look, however, the Shehlaa gown did nothing for her. Not sure whether it was the heavy duty makeup or the uneven length of the inner material that didn't work. Twinkle true to the Timeless Beauty award she won, she chose a classic DvF print wrap dress with some breathtaking jewellery. The green minaudière stood in contrast with the dress. She looked good, but I think a bit older than she actually is. Aditi looked great in a Monisha Jaising Couture dress at the awards. She kept it simple with dark lips, black pumps and side-swept hair. Kriti looked like she was out on a casual coffee date wearing a striped dress from Dior‘s Spring 2014 collection. With her hair flying around and hardly any accessory the look was not one for an Awards Ceremony. What do you think of iCynosure's Fashion Verdict? Follow iCynosure on Facebook | Twitter | Instagram | Pinterest for your dose of updates. Agreed with almost all your verdict asides Shilpa's. I think she kept the accessories to a minimal so as not to distract from the gorgeous dress. To me it was a hit.